NAIROBI, Kenya – The Kenyan government has strongly dismissed a report that shows Kenya’s police killed 121 people from January to August 2016, as reported by a Kenyan daily newspaper. The Daily Nation Newsplex database showed that Kenyan police had killed 114 people in the same period last year, and that 262 people have been killed since 2015, in the rising cases of extra judicial killings. Kenya’s Interior Security Cabinet Secretary, Joseph Nkaissery said the report was unconfirmed and aimed at tarnishing the reputation of the Kenya Police Service. He said the government was aware of a conspiracy by “non-elements” to undermine the work of the National Police Service. “The media is biased against police in its blanket condemnation of the service. We are still investigating this report to see if there is an inkling of truth in,” he said. 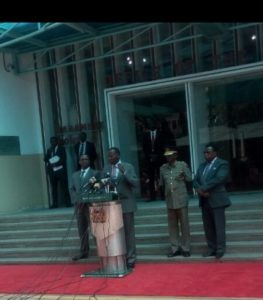 The Cabinet Secretary urged all “peace-loving” Kenyans to continue supporting police amid efforts to secure the country. Among the killings linked to extra judicial cases include those of Nairobi businessman, Jacob Juma, human rights lawyer, Willie Kimani, his client boda boda operator, Joseph Mwenda and their taxi driver, Joseph Muiruri who were all found murdered in 2016. The shooting of three suspected terrorists at Central police station in Kenya’s Coastal City of Mombasa also raised questions of extra judicial killings, the matter worsened by a human rights report that many are sanctioned by the government. The Daily Nation revealed that police killings of Kenyans are on the rise but said it hoped its database would help policymakers tackle police impunity. In the United States, the Federal Bureau of Investigation announced last week it would begin tracking police use of deadly force, US media reported. But Kenyan authorities do not track police killings. Cases included a four-year-old girl shot near a demonstration, a 14-year-old girl whom two officers said attacked them and scores of young men in the slums described as criminals by police.